So this is my card... I did not know really what to do and now that I see it ready for posting.. I should of added a little crown somewhere.. but I went with the black/grays and white and kept the monochromatic look. I was really please overall how it came out and since I don't really do monochromatic I pat myself on the back.. I chose mft dp and other scraps and did the side strips on the righ and added black and white twine along the left side to cover the white image where it meets the designer paper with the alphabets on it. I took two punched circles and added a brad and put it over the bow.. I'm pleased and hope I encouraged you to play along. 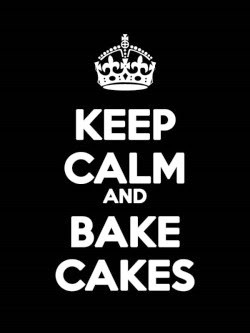 I used the image tall birthday cake. Wow it's the end of the month.. where did February.. I sure hope all of the states are thawing out and I hope March will be a better weather month. 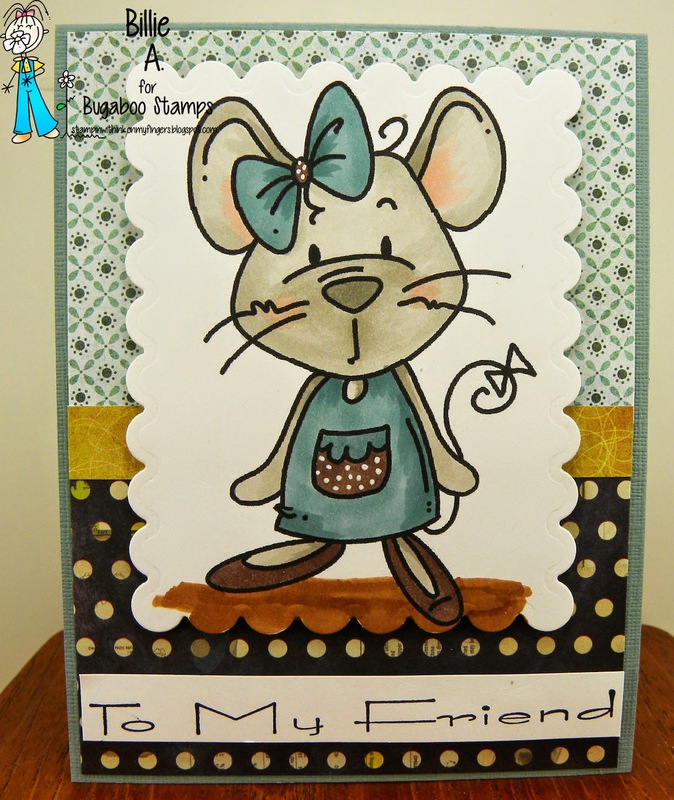 This is the girl mouse image that is free today.. I colored her with copics, and used BG Lucille paper, and the sentiment is from Dolphin song.. 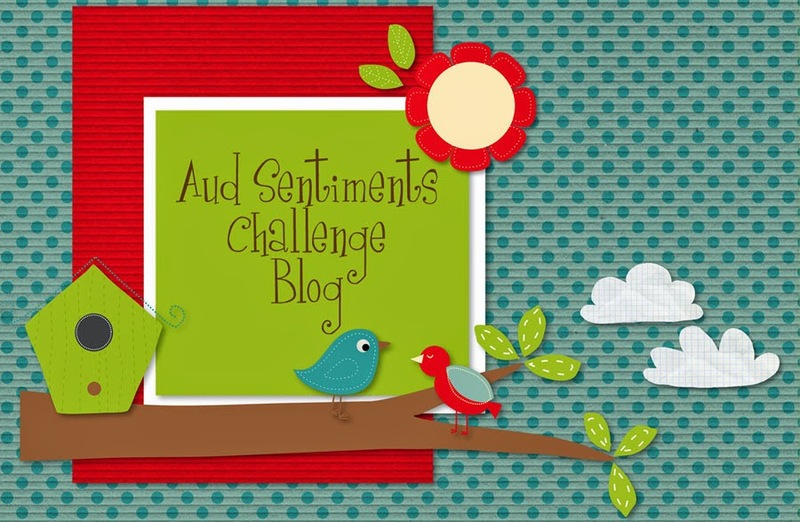 Welcome to a new challenge at Aud Sentiment are challenges run for two weeks. 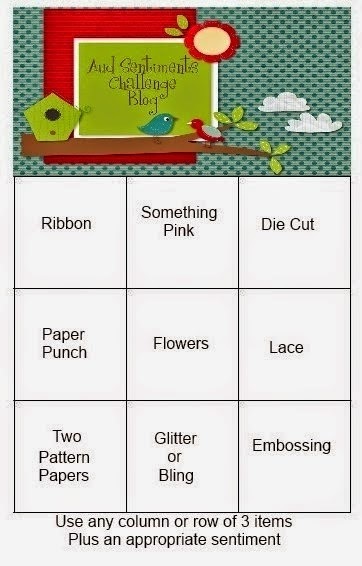 This is challenge #126 and it's BINGO choose any three in a row.. This is the bingo card to follow. Choose any three in a row.. AND MAKE SURE YOU ADD A SENTIMENT.. 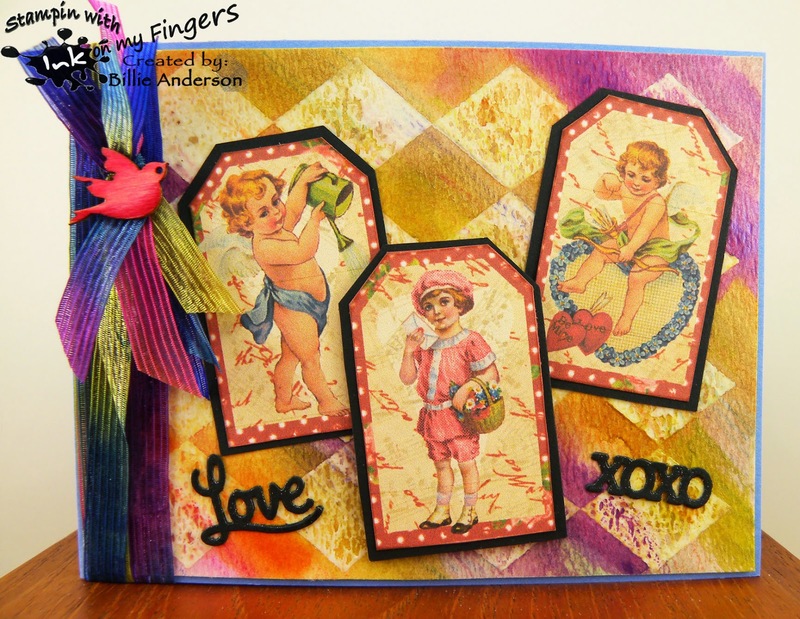 This is my card using the pre colored images from My Artistic Adventure - Victorian Vintage Valentine sheet. I was not sure what I wanted to do and so my first thought was choose what images I wanted to use,, the sheet comes with a lot of images then I chose what row I wanted on the bingo card.. I chose Ribbon, Something pink and Die cut.. then ok what was I going to do for background.. So got out my water color paper and clear embossed the diamond stamp on the paper and then took out my H2O's and went to work on coloring and spritzing with water and coloring more. I took some water color pencils and added a touch here and there but really I cant tell where. The H2O's did 99% of the work. I love it.. dried it and then found in my stash this awesome variegated ribbon which picked up the colors perfect and added black behind the tags to help with making the tags pop.. Added a wood bird that I colored with copics, added some die cut's which is Love and XOXO which is my sentiment.. which is required.. I used a su card stock for the base. I so love the look. I don't do this kind of work so it was fun making it come together. Did you know that February 28th is Floral Design Day?? I didn't either and wanted to make a card for this day and since I don't arrange flowers I felt safe with a single rose.. It's designed... as single floral design.. right up my alley. 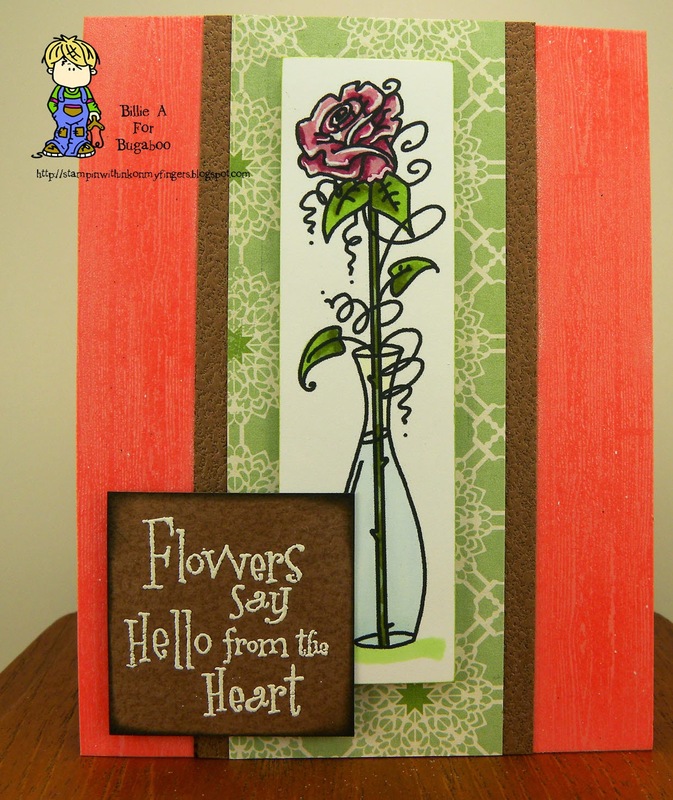 I used the image fancy rose vase I had the brown and green put together for another card but I did not like it for that card so I decided since it was still sitting on my craft table off to the side.. would this work on this card.. Yup it worked. I just cant throw away anything and again I am glad I didn't. I wanted the rose to stand out and it does against those colors. I did the embossed background in clear embossing powder using a wood grain PTI stamp, I like the added texture it gives to the card. I love this sentiment it's from hero arts. 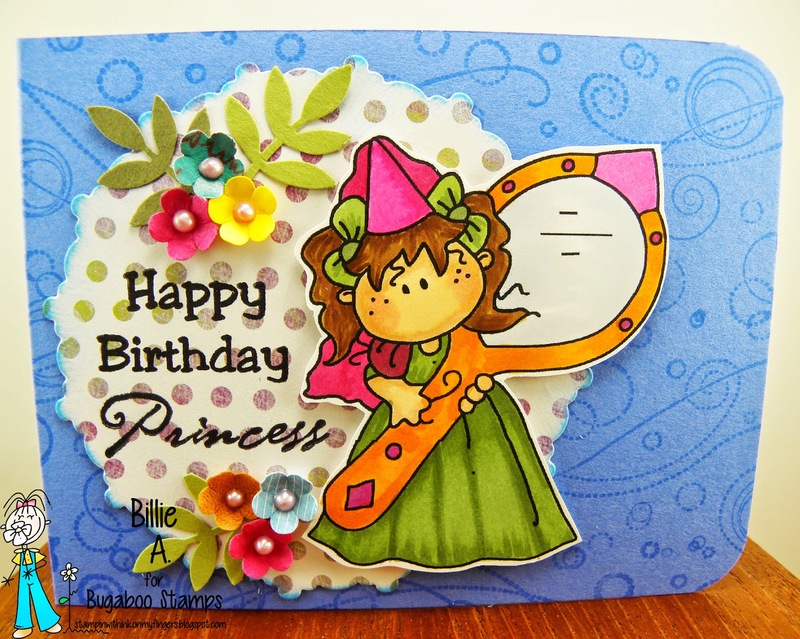 I made a cute party card using the image Make It Snappy birthday girls I wanted some bright colors and I think I did it. This was a lot of fun to color. I kinda gave each girl a different hair color and added some nice colors. The sentiment is a Simon Says stamp. I added a little swirl and a lollipop flower. 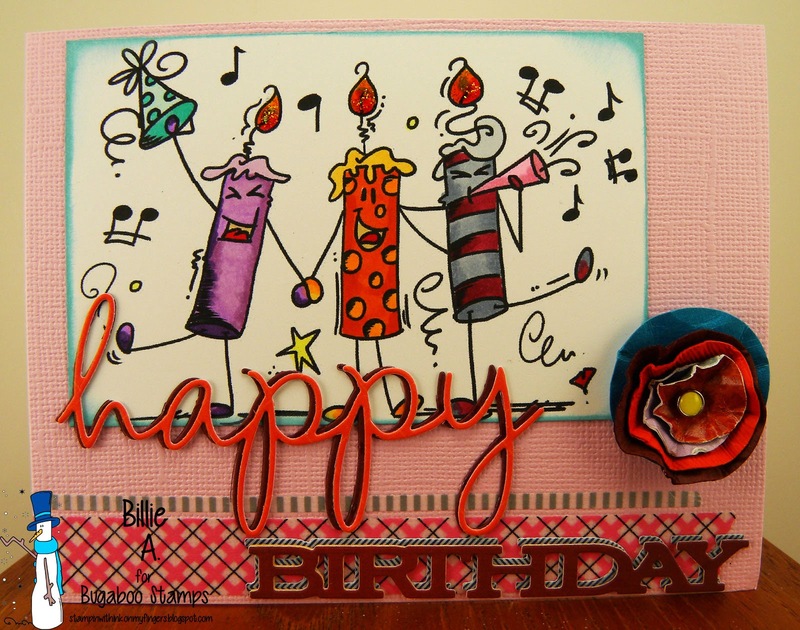 Humm who will get this birthday card? 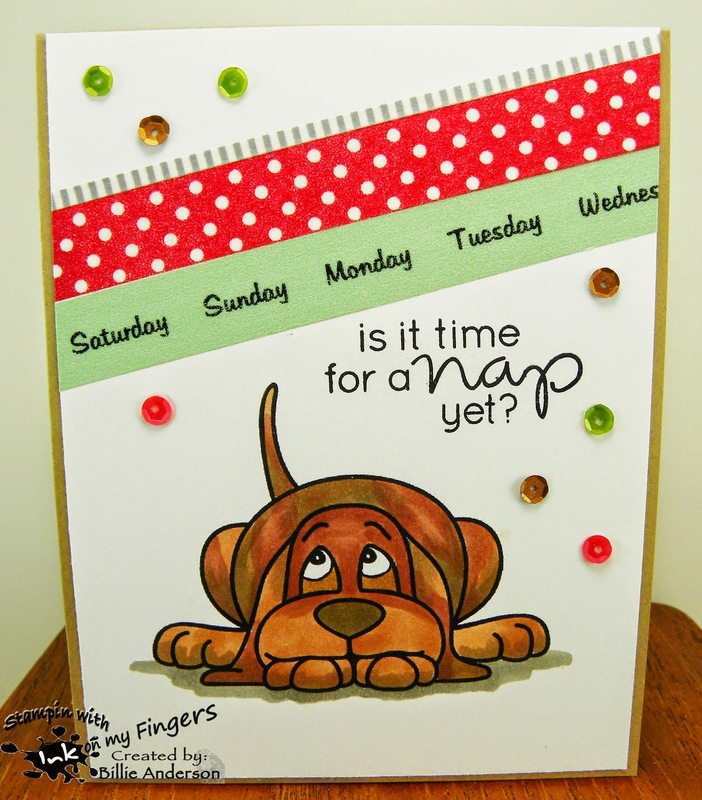 Inspiration Destination # 22 - Always anythign goes - is it time for a nap yet? I chose to use the image Basset .. he is so cute I just love the look of his face. I wanted to keep the card pretty simple because he speaks so much with that look. I used washi tape above him and with the sentiment - which is from Simon Says, I thought the Saturday Sunday Monday Tuesday...washi tape went so well with the sentiment. I added a few sequins and called it done. I colored him with copics. 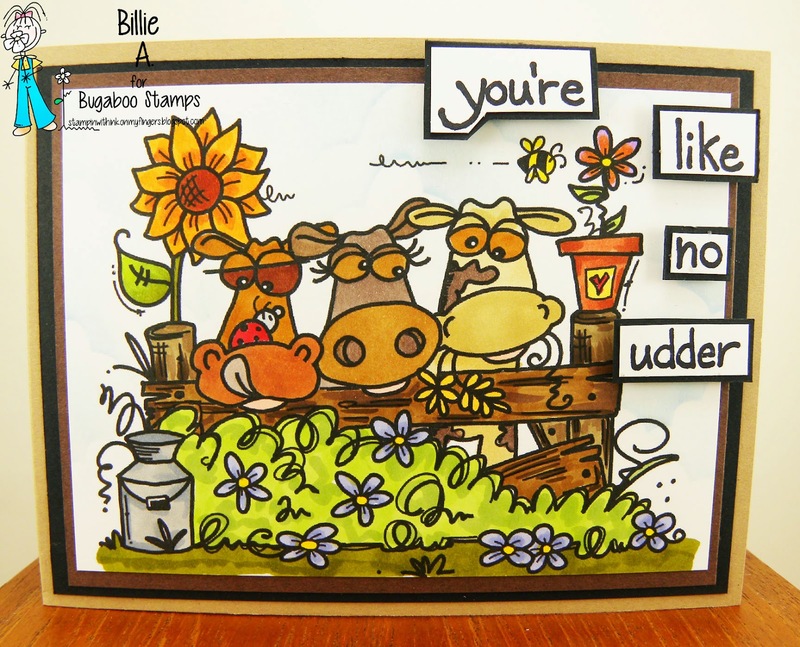 It's the last new release for February at Catch the bug..
Aren't these trio of cows cute and funny. I love the ladybug on his nose and he's trying to reach it with his tongue.. Too cute. I see our neighbors cows all the time and wonder if they are as funny, I know they are sure cute and they just had three new babies. 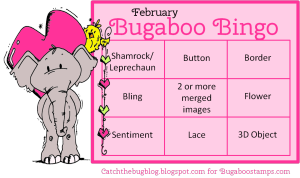 Catch the bug Saturday challenge is BINGO..
You know how to play bingo... just choose any three in a row.. 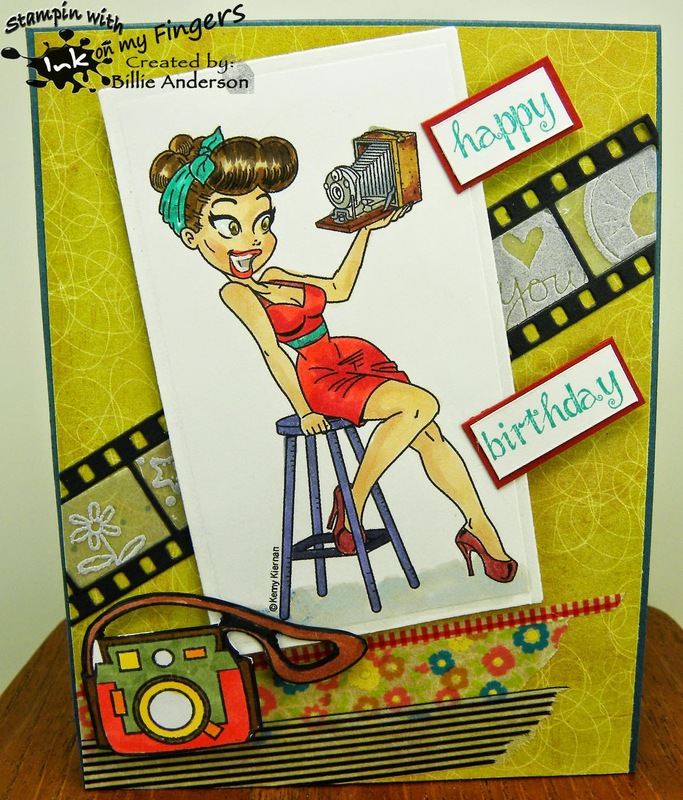 It's time for more birthday cards and my SIL birthday is next month so I thought this would be a great card for her. She loves to play the piano and sing so thought this would be perfect. She's such a fun exciting lady. This is my card.. I wanted to use these candles for some time, its called candle set I had a fun time coloring them and making them come alive. 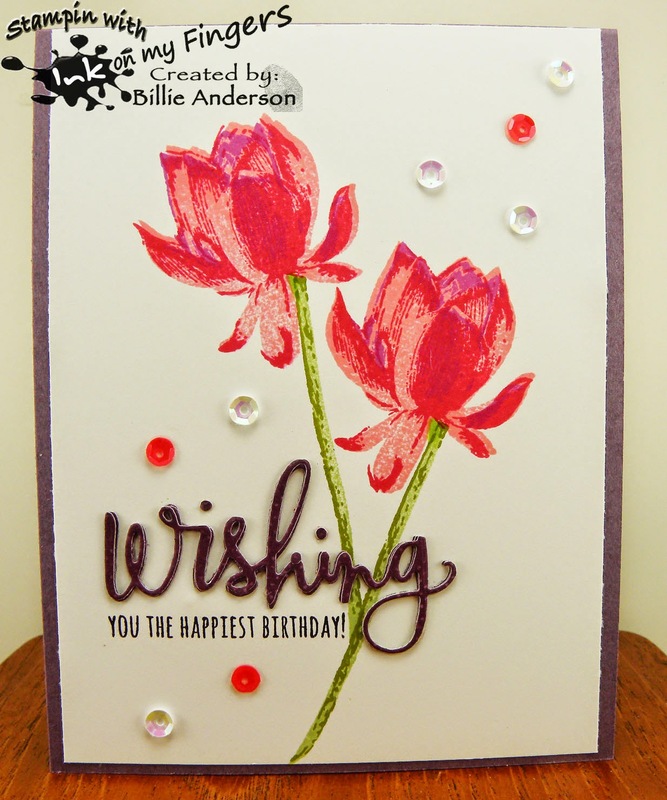 I used my lollipop flower when I hope is considered 3D.. and some awesome sentiment dies from PTI.. very festive card. Well I made my own background paper again.. I used water color paper and an overall star background stamp and clear embossed it, heated to melt and then I took some Ultra color wash jewel sprays and just sprayed away till I got the effect I wanted. Then I dried it and took a paper towel over the stars to wipe off the excess inks. Then I cut out the Free Friday image and added her. I had some cute sentiments from My Favorite Things and chose this one and cut it apart. Colored the sentiment with color pencils and added them. 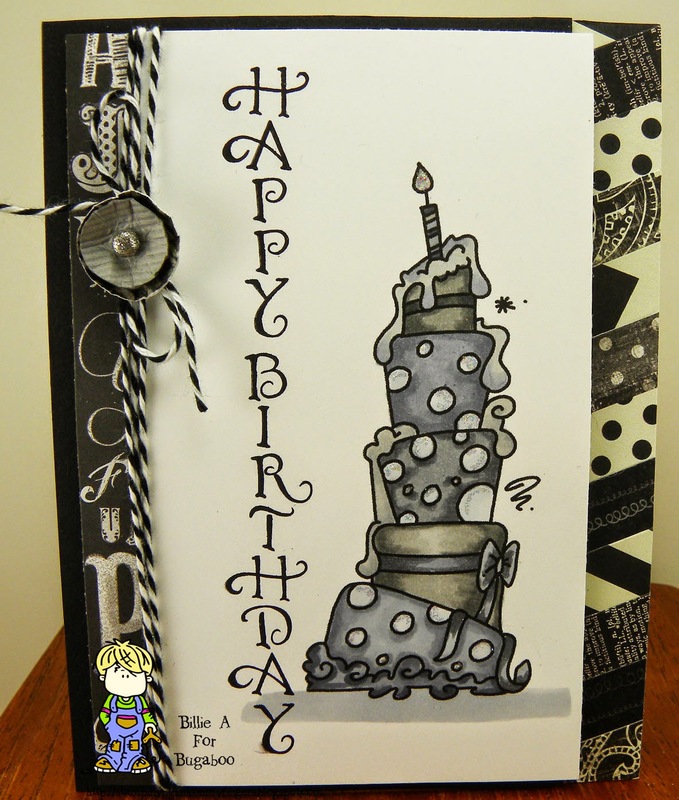 The base is stampin up card stock. I am liking making my own background papers. 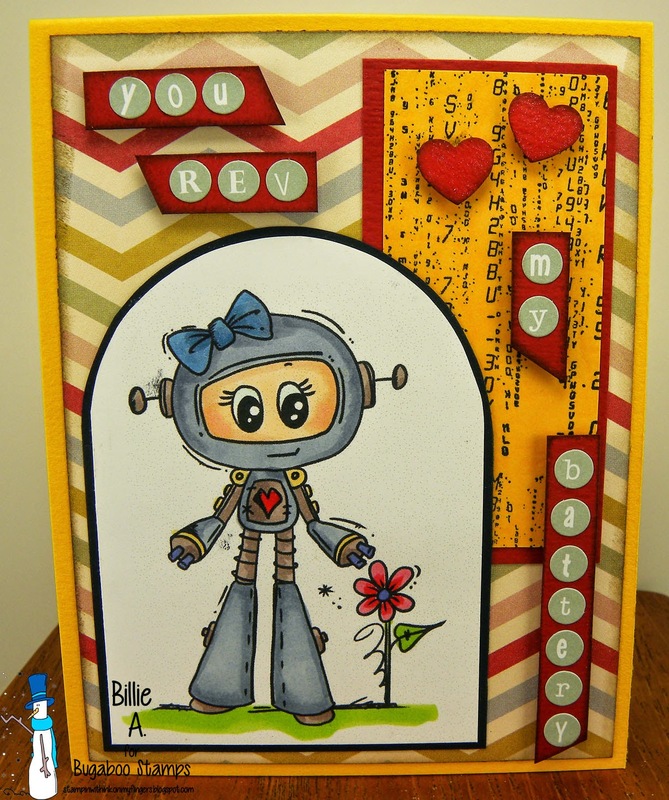 So this is the card I made using the image Girl robot I know she has to run on a battery... right? It looks like it with the plug end look at the end of her hands/arms.. Any how I used her and thought the sentiment went well with it. I think I will give it to my hubby for our anniversary which is in this month.. She was fun to use. This is the second time I made a card using her and both are so totally different. In case you cant read the sentiment too well it says "YOU REV MY BATTERY"... cute huh. I thought so. I hope you enjoy. I am using the darling image Fairy flower outing image. She was fun to color. I put wink of stella on her wings and flowers but it barely shows in the photo. I love the images from A day for daisies. They are always so cute and fun to work with. This week we got to use any image we wanted and make any project we wanted so I chose a new stamp set I got from my best friend for my birthday.. It's Lotus Blossom. It's a three step stamp, you stamp light, medium and dark.. Looks good huh. I had a hard time doing the stems because I did not give enough room I should of done the stems first and one flower then the other stem and flower.. But at this point I didn't want to do over. I die cut the wishing from simon says and then the stamped sentiment from simon says. Added some sequins and mounted it card image on some su card stock. 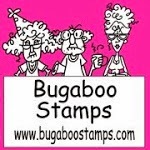 It's Tuesday at Catch the bug so it's new release day from Bugaboo.. Here is the cute little critter called Mouse Hearts.. I had fun coloring him. I found this dp background with the green hearts and then the dotted paper and I liked them paired up.. I used a strip of yellow to hid the seam. 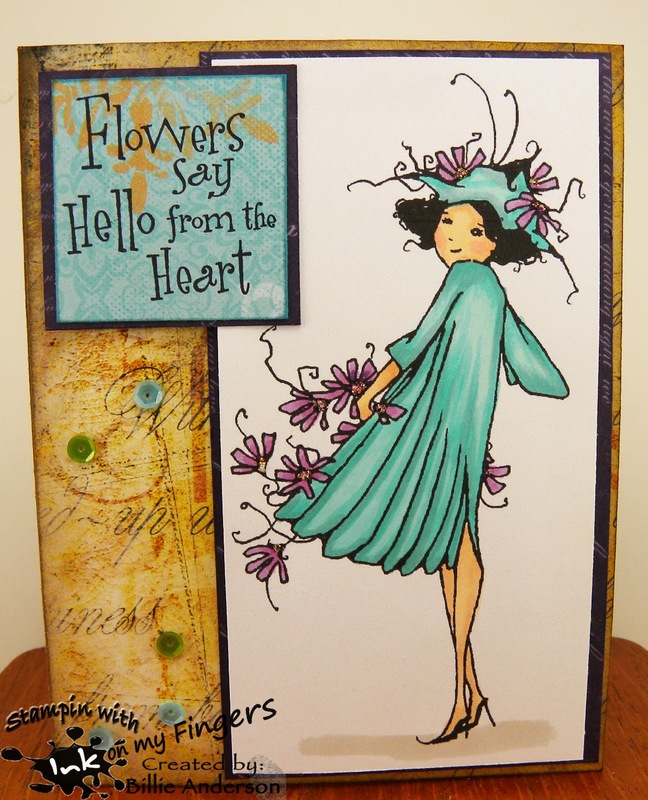 I had some die cuts in a box so dug through them and found the corner pieces, the swirl and flower petals..oh and a leaf.. so added them and I think it made for a fun card. The sentiment was perfect for this card. I am happy with the look. I added wink of stella on the hearts but you really cant tell in the photo. The sponsor for this challenge is Great Impressions. Great Impressions was founded in 1984 by Ken and Deone Mackenzie. With a love for stamping, the company grew. The result is quality rubber stamps in either wood mount or stickable mount backing for all your stamping needs. Great Impressions' goal is to provide the highest quality stamps and to inspire creativity! Please check out our online store to see over 1, 000 stamp designs today ! We know you'll find something that will leave a "Great Impression" on you! They have some awesome images and they live in my county about 25 min from my house.. woo hoo for that. 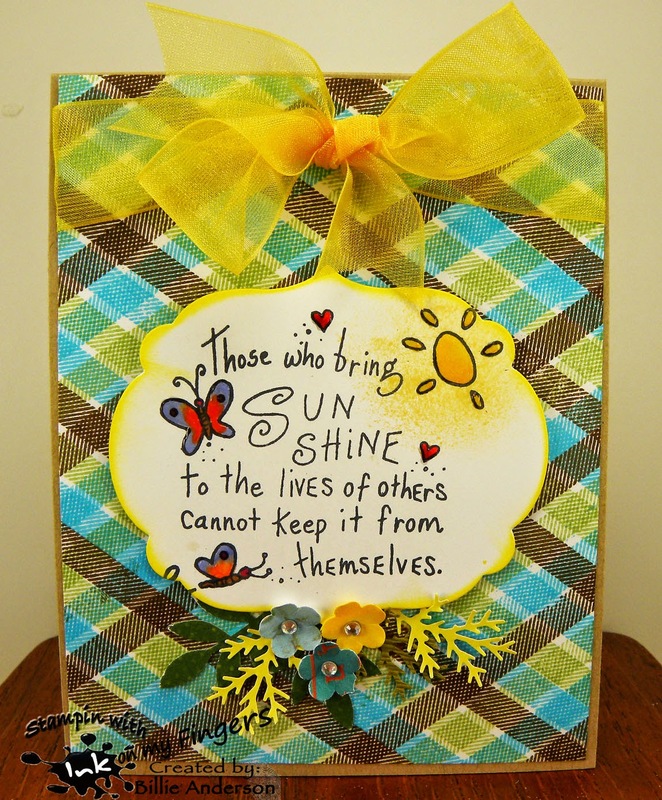 I do have a few of their stamps and I chose this one for the Spring theme of our challenge. I don't remember the name of the stamp so sorry about that. I just colored the image in and I also made the background paper. I used the plaid stamp set from MFT and only one line of the set and just repeated with different colors. I couldn't figure out the colors to use because I didn't want summer bright colors or fall so figured since it's to be spring that would use these colors. I like the way it came out and it really showcases the Great Impressions sentiment piece. I hope you play along and remember to put your sentiment on the front of your card.. There are two sponsors and I set the blog up as separate so .. I don't know what I was thinking other than it was way past my bed time when I added my card cause I made this one at the last minute. So you will get two postings for Inspiration Destination #20. This is my card using the image Retro Selfie funny huh. Now days with cell phones and selfie taking this is just too funny and you know you've done it with one of the old time camera's before cell phones. I know I have. I used the film strip from Taylored Expressions and then took velum and embossed different images in each film cell. I used the camera stamp from Taylored Expressions and colored it with copics. Added some washi tape at the bottom to give some interest. The sentiment is also from Taylored Expeessions, I just cut it in half. I think it all goes well with the Kenny K retro selfie image. two postings for Inspiration Destination #20 but they are separate. Late nite posting I did not add the second card to this post. This is my card using the image Fluffy Baby Penguin... I know I did not color as a penguin cause I thought he looked enough like a chick to get away with it.. I love it when I can make the image what I want it to be with out altering the image which I wouldn't do in respect to the artist. But I can color it any color I want which in this case is a little chick that is so in love.. I stamped the "love you" inside the heart and embossed it then used the sentiment that kind a went with it. cute little creature huh? I love the houndstooth paper and I think I am close to being out of it. I had this little sticker heart/button from recollections (Michaels) I have been hoarding.. I only have one left now.. I used wink of stella all over the chick but I don't think you can see it.. 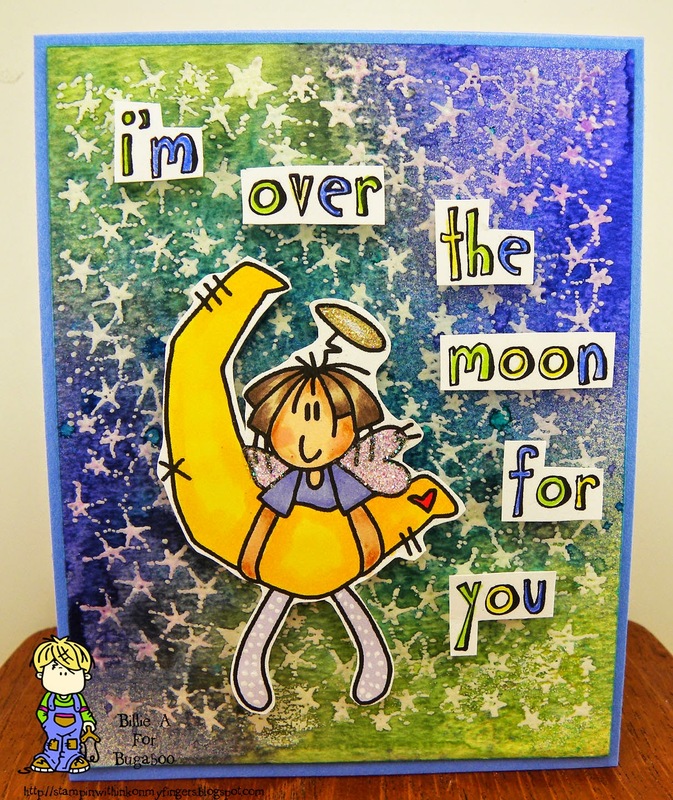 I hope you play along at Inspiration Destination for our ALWAYS ATG challenge. This is the fun card I made using the image Girl with big heart.. I had to add more hearts besides the one she is holding.. I have this large heart die panel from Simon says and cut this out. (Gee wish I would of done it last week when I made the shaker card.. all those tiny hearts would of been nice in it.) But I saved them for a future shaker card. 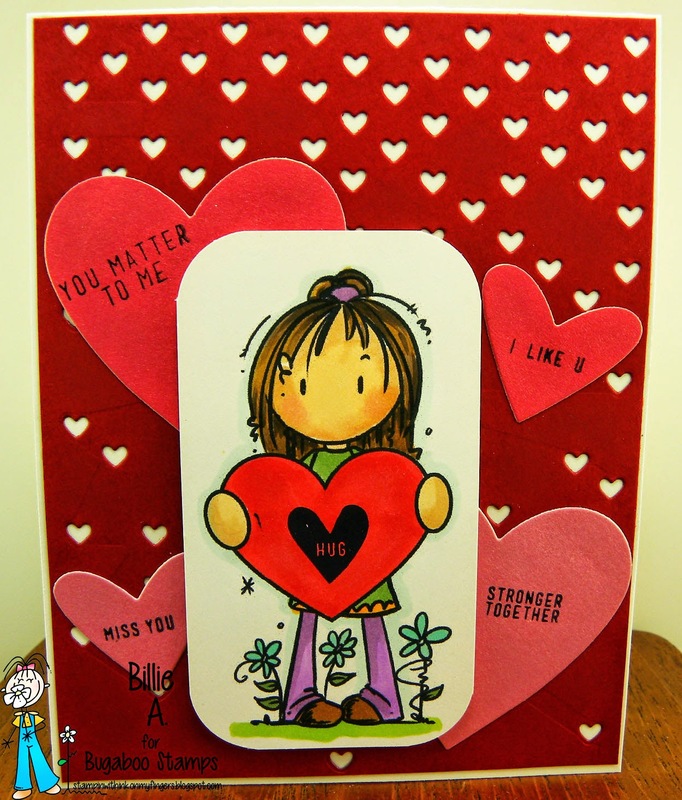 I also had some nice red card stock so cut out some hearts with my favorite things dies and stamped some cute sentiments from Simon says on each and on the heart she is holding. I used a image like this one on yesterdays card but they are different ... believe me. This one has the heart and they are face to face, the one yesterday was with more flowers and they were not as close. 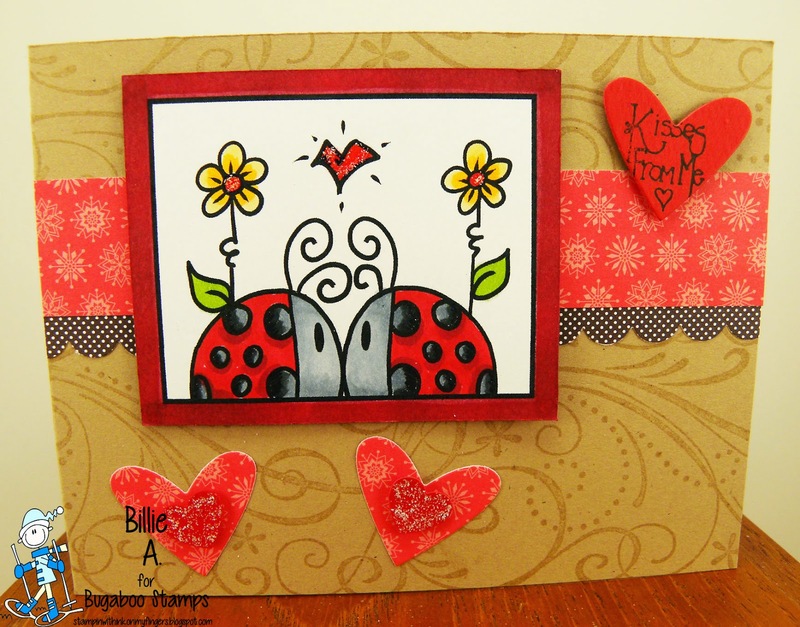 This is my card for the ATG's.. My image is ladybug block trio.. I used #2 I love ladybugs and in fact have a few tattoos of them.. I have a co worker who wanted a birthday card with ladybugs on it so I made this for her to give to her MIL. 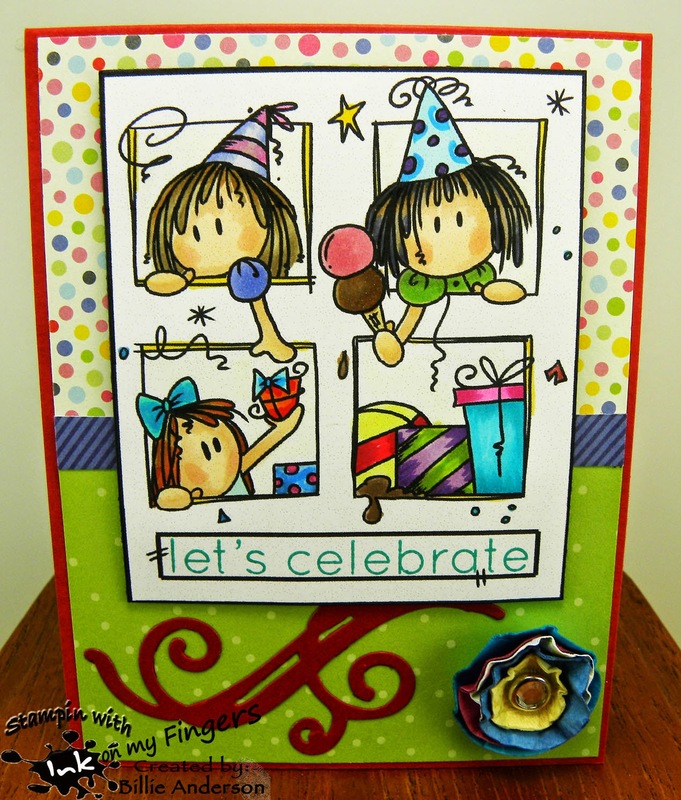 I took a kraft card and some ss ink kraft looking and 4 different HAPPY stamps and just repeated the HAPPY allover. Then colored the image and layered it on some red. I took a black dotted ribbon and red and put them together and tied a know and trimmed it and added it below the image. I die cut the Birthday out of the same red behind the ladybug image and adhered it down. I colored the image in copics. 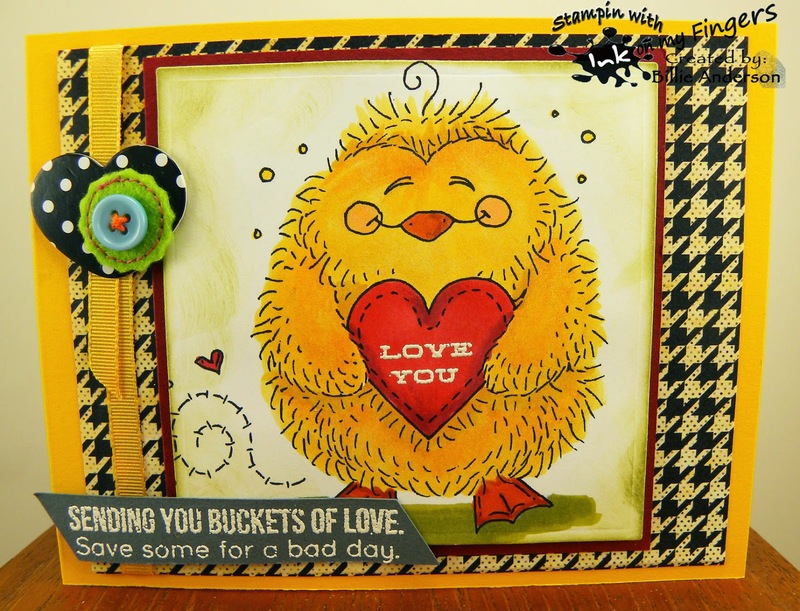 Fun happy card. 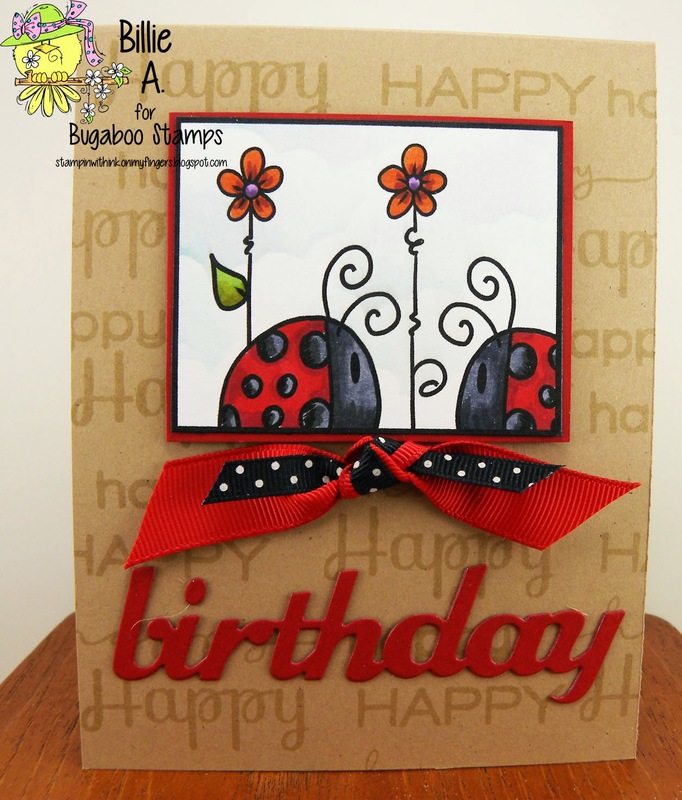 recipe: ladybug trio/ctb/bugaboo, kraft, scraps, ribbon, ss stamp, pti die, copics, my cloud template and ranger ink.